Kalanchoe has long been known as an effective remedy against common cold. The advantage of the plant is its availability and possibility of application even in young children. Clearing clogged nose juice of Kalanchoe makes breathing easier and speeds recovery. For the treatment of rhinitis in children under one year, use the decoction of Kalanchoe. Finely chop 100 g of leaves and pour them a pint of boiling water. Warm the liquid on a water bath for 20-30 minutes then strain and cool the broth. Instill 1-2 drops into each baby's nostril 2-3 times a day. For the treatment of rhinitis in children aged 1-1. 5 years use diluted juice of Kalanchoe. To make it, skip the 50 g leaves of the plant through a meat grinder. The resulting slurry was wrap in double layer cheesecloth and squeeze through the juice. Mix it with boiled water in different proportions. Instill 2 drops of the mixture in each nostril 3-4 times a day. For the treatment of rhinitis in children aged 1.5-2 years use pure juice. Soak a cotton swab in freshly prepared juice and gently wipe inside her nostrils. Carry out the procedure carefully. If a child behaves restless, the probability of injury. The kid can not agree, it is better to drip the diluted juice. Children older than 2 years bury the pure juice of Kalanchoe. It is also suitable for the treatment of rhinitis in adults. Dosage for baby under 3 years - 1 drop in each nostril 3 times a day, child 3-10 years - 2 drops three times a day. At older ages, drip 3-4 times daily 3 drops to a full recovery. Before starting treatment of Kalanchoe, make sure that the plant is not allergic. To do this, drip a cotton swab a drop of juice and gently lubricate her nostril on the inside. With the appearance of mucosal edema and watery eyes, take an antihistamine and avoid treatment with this agent. 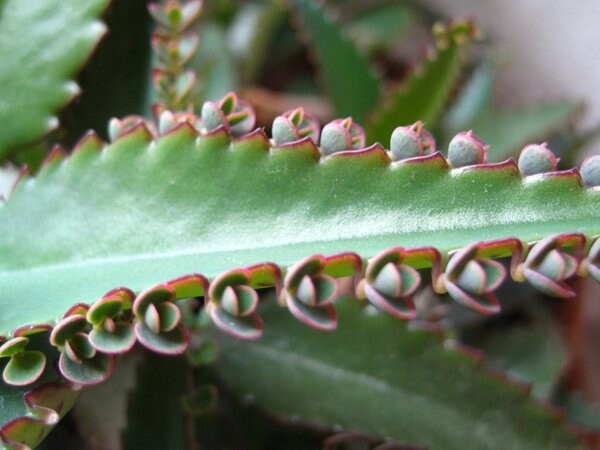 To improve the effectiveness of treatment Kalanchoe juice can be mixed in equal proportions with aloe juice. Dosage drops will be the same, but the recovery will come much faster.